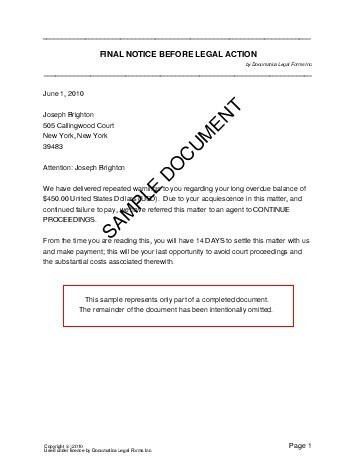 A Final Legal Notice is used to warn a party who has failed to pay you that you are prepared to commence legal action and/or refer the matter to a collection agency if the party does not pay you within a specified time period. Do you wish to reference the account number? What is the balance owing (e.g. 570.00)? Has the sender passed this matter onto a third party? How many days does the recipient have to resolve this matter (e.g. 10)? Do you wish to add other details? We strongly recommend obtaining an attorney reviewed Final Legal Notice directly from us. Below are some random samples we have created with Documatica. Please note that these documents reflect a certain set of answers, and it is very likely that the document you require is different. 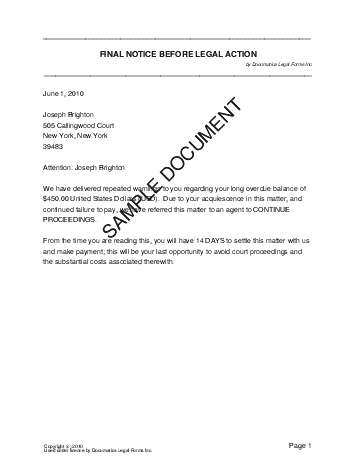 Do not rely on the templates below - create your own customized Final Legal Notice with our webpage. For maximum legal protection, obtain a lawyer reviewed Final Legal Notice directly from us.